The world lost science fiction luminary Ray Bradbury today. At 91 years old, Bradbury had a career that spanned over 70 years and included over 500 stories, 40 plus books and many TV and movie screenplays and adaptations. Bradbury was one of my first exposures to Science Fiction and Fantasy. When I was in elementary school, my mother managed a college bookstore. I was a voracious reader and she would frequently bring in books students had returned that were in no condition to resell and the store’s overstock. The books were frequently science fiction yearbooks/anthologies and Bradbury was almost always included. While he was known primarily for the dystopian Fahrenheit 451 (Nerd shame: I haven’t read it) I devoured his short stories, some of which had been adapted in to episodes of The Twilight Zone and Alfred Hitchcock presents. I always felt such a sense of pride while, when watching a Bradbury inspired story, I recognized the source material. 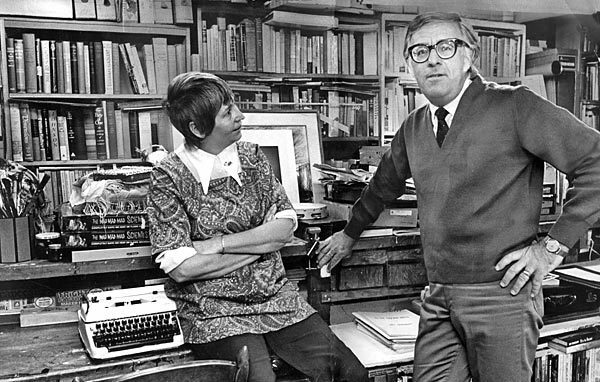 Bradbury didn’t really consider himself a sci-fi writer. If you look at the breadth of his work you will see that he actually wrote a lot of Americana and fantasy. Regardless of how he thought he should be classified, Bradbury was inducted into the Science Fiction Hall of Fame in Seattle in 2004, and is considered an icon in the genre. Thank you Ray Bradbury, for introducing so many of us to other worlds, other times, other frames of mind. The world is a better place for having had you in it.